You won't go wrong reading this excellent brief for your trip from Roko Ki resorts. 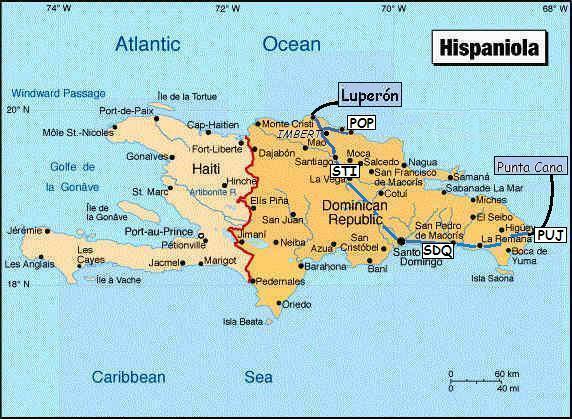 Luperón is a an hour drive from Puerto Plata (POP) airport, an hour and a half from Santiago (STI), half a day and maybe an overnight from Santo Domingo (SDQ) and a full day and maybe an overnight from Punta Cana (PUJ). See my map for the locations of the airports. Whether to rent a car depends on if you want to tour the country or just hang out at Luperón. If a car, rent an SUV at the airport (about $50/day), and use the ROUGH GUIDE to DR. If a bike, take a taxi and consider renting a motorbike in Luperón for about $15/day. You can rent cars in Luperón should you want one (note: always take liability insurance). If you have no experience in motoring around in developing countries, or have anxieties about it, use buses and taxis. For more than 20 years I used public transport (buses, motorbike taxis) to get around in the DR. Never bothered me . . . Otherwise, you have the gamut from luxury to flophouse. Across our hill South Africans Margie and Brian have a Hollywood/Malibu sort of cliff-hanger with kitchen and deck, and a huge picture window (look for "The Rest" at www.travel-library.com). Willi and Inez Freund operate a B&B down the hill from us called Pequeño Mundo (809-264-3511), some with a/c, some not. Nearer to town is another, Casa de Sol, with Heidi and Stanislaw with an excellent restaurant. Luperon Beach Resort has 1500 beds, all inclusive plan, and cuts deals for walk-ins (google them). Marina Puerto Blanco even has rudimentary rooms. You can stay in town far from marinas but close to the action. There are several options in town, such as El Paraiso (809-571-8823/787-8282), if you pick a room with quietude -- some people are able to sit right over a raucous bistro or bordello or muflerless motoconcho route. There's no lack of options to suit your taste. Car rental companies have roadmaps. Main arteries are pretty good. Secondaries sometimes are surprisingly good, perhaps depending on the Road Department officials who own retreats in the area (as in New Jersey), but don't bet on it. Tertiary roads can ruin any but a 4WD SUV, but they make for spectacular touring between amiable villages. Younger athletic tourists can take a dirtbike or burro on the next down tier of roads. You should initially drive only in good light, or between the hours of 7 a.m. to 6 p.m.
To avoid potholes, keep your eyes 20-30 yards ahead, not hundreds as you do on roads at home. This takes practice. Don't stop for anyone waving you down, until you understand the culture, which takes time. On a motorcycle, do not use the middle of the road as they advise in North America. Ride the shoulder. Dominicans like to ride the road's center and to take curves on the inside. Expecting this takes practice. Dominicans love to meet and chat through the driverside windows of their pickup trucks just over hills and around curves or both, entirely blocking the road. Expect them, or four-legged animals, as you barrel along a country road. Always lock up so your car isn't stolen by a deportee from the American prison system's "crime universities". Most of the country is old fashioned free-range. It's a great old-time American system in which landless poor can raise livestock. Even better, if you kill a sheep, goat, horse, donkey or cow, by law you can take the roadkill home and eat it, and the free-range farmer has to pay your damanges as well, if you can find him, and if he has money, and most importantly, if you survive the crash! Better that you sissy-drive for your first year in the DR. Check out these videos for a clue. You drive from the airport through all round-abouts, through Puerto Plata toward Imbert, a town just south of the highway about 15 miles west of Puerto Plata, via the Santiago - Puerto Plata highway. Every rainy season causes washouts and landslides for which you may encounter small detours, heavy equipment and rough patches. More commodious routes exist through Puerto Plata, but the newcomer had best stay on the "highway". West of Puerto Plata, you'll enjoy the spectacular scenery which backdropped much of the film "Jurassic Park". 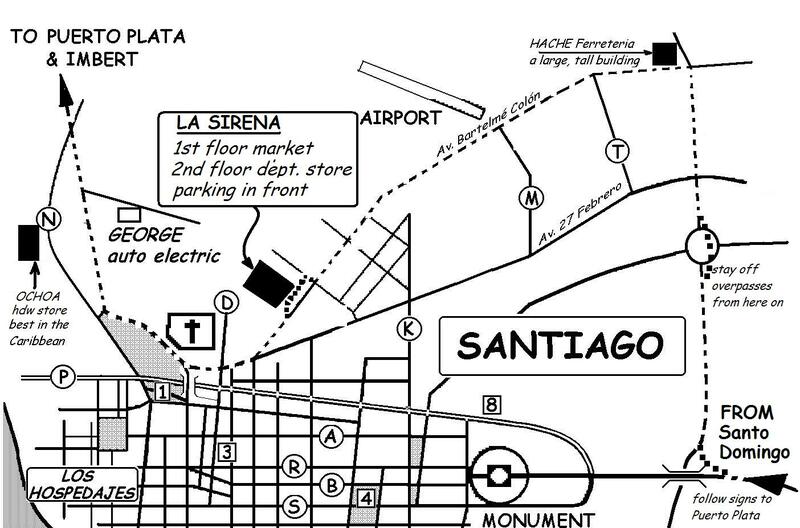 For the new bypass connecting the Puerto Plata—Santiago highway to the Imbert—Luperón highway, look for a broad turnoff to the north a mile or less east of Imbert after coming out of the hills onto a huge vista of sugar fields. Unless they have recently cut or burnt off the sugar, you may not clearly see the turnoff. High sugar may obscure both it and the sign. Not to worry, if you miss it, you can continue to the crossing at Imbert and turn north there on the old road. The town of Imbert lies just south of the Santiago—Puerto Plata highway about 15 miles west of Puerto Plata. The junction at Imbert has various roadside businesses clustered about and a large Texaco station on the southeast corner. It connects to the secondary highway running north from Imbert through Luperón to El Castillo on the coast (La Isabela Antigua), the first European settlement in the New World. The Imbert junction with the secondary highway to Luperón occurs just east of a long bridge over the spectacular gorge at the river Bajabanico. It's at Imbert that you leave the Santiago—Puerto Plata highway, turning north to take the smaller highway to Luperón which ends at the coast at El Castillo. The gasoline in Luperón isn't the best. I recommend you fill up at the Imbert Texaco. The smaller highway from Imbert to Luperón trends northwest until it does a hard left turn in Luperón where it ends at the coast at El Castillo. When you get to the statue of General Luperón on a horse with his sabre raised, swerve around the statue to continue on the main road which passes the General on his right side. (I know it looks one-way, but it isn't.) The highway turns 90° left in the middle of Luperón at a traffic light that rarely works and is rarely obeyed when it works. Gringos call that corner maniac corner. You'll see why when you get there. It's the motoconcho (motorbike taxis) transportation crux of Luperón. About a mile past maniac corner you shall pass a bunch of signs for Marina Puerto Blanco and Luperon Beach Hotel at a tee-junction to the right. You might find Rosa at the Marina Puerto Blanco, but anyone at the marina can call us by telephone or VHF radio. Our telnos. are 809-543-0079/452-1125 for Rosa, and 809-821-8239 for Bruce. On the VHF radio Rosa answers to TINGAL, and I answer to TIDAK APA. We both answer to KEMBALI, the house. Do not take the right hand turn to Puerto Blanco Marina, but continue on the highway, going uphill for a couple of short curves, until you see the bed-and- breakfast Pequeño Mundo at the top of the hill on your left. Turn left at Pequeño Mundo and then take the first and only right turn onto a dirt road which curves around and uphill to our house on the right at the top of the road. And pray it isn't raining. The gate says KEMBALI KE TANAH.